When it comes to about everything January is just a very yawnful month. The weather is grey, people’s gazes are tiresome and, most importantly of course, the number of new album releases is at an all time low. For God’s sake, the sooner January is behind us the better. In the past few weeks I feared nothing relevant would be brought out. Luckily I was wrong. The Canadian post-punkers Viet Cong decided the beginning of the year was an excellent time to release their first studio album and since I was trapped in the wrong venue during last years Le Guess Who festival a review of this album seems a good idea to start our year with. Viet Cong arose from the remains of the art-rock band Women in 2012 and never recorded a full length studio album in the time following. A ‘tour-only’ EP on cassette is their only physical product to date. After signing with the Flemish Eye label the recording of a full length album was one of the obvious new goals. Vocalist/bassist Matt Flegel however didn’t plan any writing sessions to tackle this project but instead developed the record by touring. New songs were directly tested on a live audience and the refined along the way. Recording the untitled debut therefore was done in a jiffy. “Before we started recording, we already knew how the album needed to sound. In the end we did not altered a lot in the studio”, says Flegel. Although the album’s third track is titled ‘March of Progress’ it doesn’t sound like one. Its the band’s overture ‘Newspaper Spoons’ that makes you wanna march around. The strong regular dark drumming eventually debouches into breezy electronica. Hereafter the real kick off takes place with some fine grooving guitar play and tight drumming on ‘Pointless Experience’ with is followed by the aforementioned ‘March of Progress’. 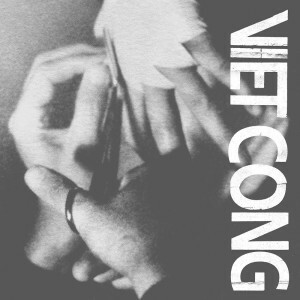 Viet Cong shows a different side of itself mixing up a noisy form of ambient with floydish psychedelica. It would be understandable just the leave with that. However, before becoming totally numb the band pigheadedly pumps up the pace and sprints to the end of the six minute track. This is a small example of the band’s waywardness, altough a few simple references to the post-punk scene are also there. ‘Bunker Buster’ has something of Deerhunter’s sharp edges as ‘Continental Shelf’ and ‘Silhouettes’ directly remind of the music of respectively Interpol and Wolf Parade. Nevertheless these tracks still are very nice listens. ‘Death’ is the 11-minute closer of Viet Cong’s self titled album. Again all stops are pulled out, tempo changes, lighthearted ooh and ahh’s, surging base play, distorted guitars, its all there. I have to say that this production is not bad at all, especially when you consider January’s meager beginning. When taking a step back I reckon that in a few areas Viet Cong’s first doesn’t sound that original. Yet, in other areas the band doesn’t shun to throw down the gloves. Taken together Viet Cong maybe isn’t worth the hype it is today but on the other hand is interesting enough to keep an eye on this year. This entry was posted in WRM and tagged 2015, album, Canada, Deerhunter, Electronica, Flemish Eye, Interpol, Jagjaguwar, Le Guess Who?, Matt Flegel, post-punk, review, Viet Cong, Wolf Parade, Women. Bookmark the permalink.